A Yankee used to be a popular horse racing bet but is now widely used across all sports. Comprising four selections the potential winnings increase (compared to a trixie) as the odds multiply. 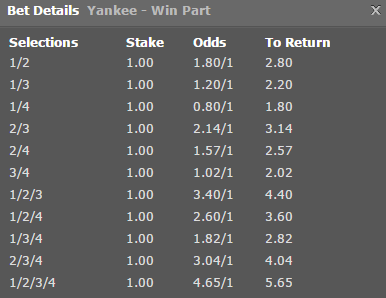 To keep the cost of the bet down, singles are removed meaning a Yankee costs 11 times your stake. Beware you need at least two winners to guarantee a return. How many bets is a Yankee? Placing an £11 Yankee (£1 x 11 bets) at odds of 2/5, evens, 4/7 and 2/7 would return the following depending on the outcomes of the selections.